For Heritage Day 2016 Nova Scotia celebrated Joseph Howe, one of our most outstanding Nova Scotians. Howe lived from 1804 to 1873 and is most remembered as the highly-influential politician who led the successful campaign for the British colony of Nova Scotia to govern itself (responsible government) and therefore to determine its economic and social success. This influence was largely due to his ability to communicate his message through his newspaper The Novascotian. 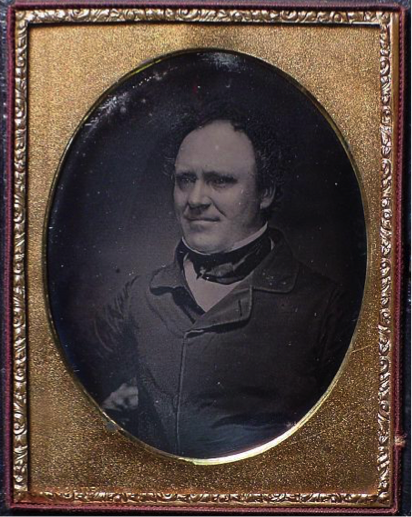 Joseph Howe’s connection to the newspaper industry began at age 13 as a printer's apprentice in the Halifax newspaper run by his father John. After ten years training, in 1827 Joseph bought a small newspaper he called the Acadian. The next year he bought the Novascotian, which he developed into the most influential newspaper in the Maritime Provinces. Howe’s Wells press (patent 1819) currently in the lobby of the Nova Scotia Archives, Halifax. Photo courtesy of NSA. 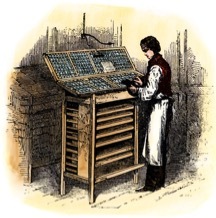 As a printer, Howe was one of several craft producers throughout the province publishing newspapers and occasionally books. He printed and published several books by Nova Scotians which have become central to understanding early provincial life, including Thomas Chandler Haliburton's Historical and Statistical Account of Nova Scotia and his international best-selling Sam Slick stories, as well as several books of poetry and on Nova Scotia law. The Clockmaker or The Sayings and Doings of Samuel Slick, courtesy of the University of Alberta, www.hathitrust.org. 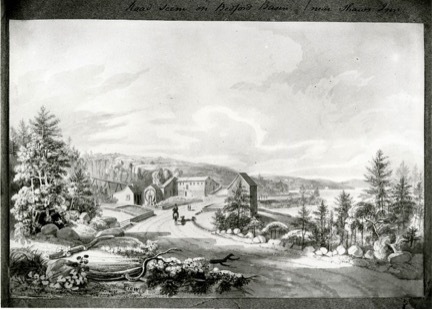 In travelling the colony from 1829 to 1831 seeking customers to subscribe to his newspaper, Howe had abundant opportunities to witness the beauty of Nova Scotia and to contemplate its economic opportunities. These he relayed to his readers in a series of western and eastern “rambles”. From such descriptions we know he visited villages from Annapolis Royal to Antigonish and admired many a “pleasant scene”. He also sought to promote Nova Scotia’s possibilities. Touring the new settlement at Albion Mines (Stellarton), Howe described the industrial complex being built by a British coal mining company: “… the Pits are situated, and you may see 10,000 chaldrons of coal lying in one body on the surface around them. – The steam machinery by which it is raised is contained in a small brick building, devoted exclusively to the purpose; from its top rises a lofty chimney, through which a stream of smoke is continually rushing, and gives notice to the Traveller of his near approach to the seat of industry and art, before he catches a view of the Mines.” In touring the works, Howe would have stood where our museum now stands. Model locomotive, Museum of Industry collection 71.237. A model of a locomotive used on the Nova Scotia Railway during the era of Joseph Howe. From before 1836 when he entered the House of Assembly, Howe vigorously promoted railways. The railway would, he argued, link Nova Scotia with regional neighbours like Saint John, Portland and Boston. It could even forge trading and political ties between the Maritimes and Quebec, if built that far. He seemed less concerned, or maybe did not dare to hope, about the railway's ability to stimulate manufacturing. Instead, he promoted the railway as a means to improve communication between the major cities and towns, to help the military defend the land against invaders, and also as a means to extend the reach of Halifax merchants beyond their city. The railway would also ensure the Metropolitan area would have fresh fruit and vegetables from the fertile Annapolis Valley and coal from Albion Mines to heat houses. An intercolonial railway however, would prove elusive for Howe, and would have to wait until Confederation before being built. In 1854, therefore, Howe turned his legendary capacity for unceasing labour toward the construction of the Nova Scotia Railway line from Halifax to Windsor, and its second line to Pictou Landing via Truro. Convinced that a project built by government would be less expensive and better made than if built by a profit driven construction firm, he skillfully organized engineers and contractors to move the railway ahead. The Windsor line, connecting Halifax to the agricultural lands of the Annapolis Valley and the steam ferries to Saint John, opened in 1858. The railway to Pictou Landing, organized by others, would open in 1867. Howe, J. (Parks, M. Ed.). (1973). Western and Eastern Rambles Travel Sketches of Nova Scotia. Toronto: University of Toronto Press. Beck, J. (1982). Joseph Howe Conservative Reformer 1804-1848 (vol 1). Beck, J. (1983). Joseph Howe The Briton becomes Canadian 1848-1873 (vol 2). Hunt, W. (Ed.). (1983). Proceedings of the Joseph Howe Symposium.